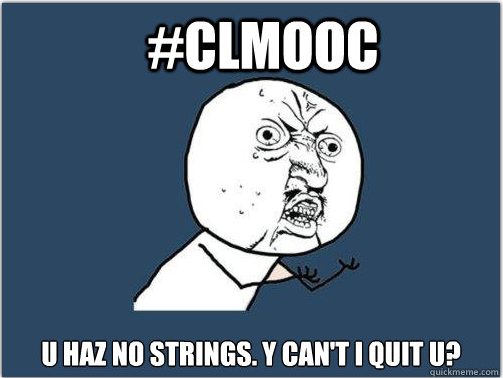 When NWP staff contacted me back in April to ask if I’d be interested in working to help create and facilitate the Making Learning Connected #clmooc, I blindly and enthusiastically jumped at the opportunity. Over the last few weeks I collaborated in real time and in lag time with my fellow facilitators in calendars, hangouts, documents, dashboards, chats, and communities with NWP staff and #clmooc facilitators to make a vision and make a plan for this massively open online collaboration. Wednesday night, I felt all of these conflicting emotions most poignantly when I hit the “end broadcast” button on our Make With Me On Air Google Hangout for Make Cycle 2. I had never hosted a live video conversation from my dining room, and I wasn’t quite sure what to expect. While #clmooc co-facilitator Terry Elliot regularly reminds us to “do one impossible thing every day”, I am much better at doing one impossibly stupid thing every day. I just hoped it wouldn’t be on air. By the way, if you didn’t join us live, you can watch it here. Impossible or impossibly stupid? Don’t worry. No spoilers. 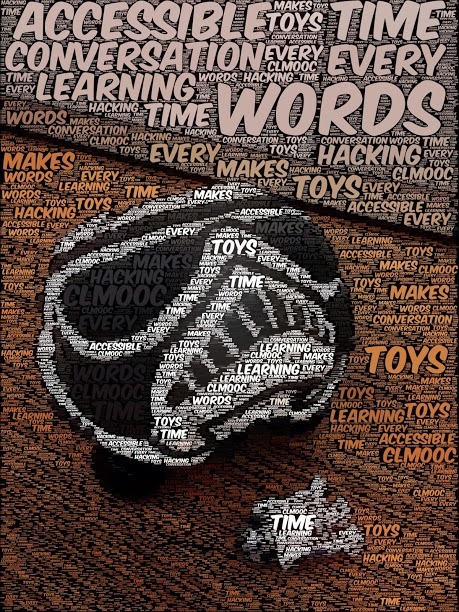 What I can tell you, though, is that our conversation helped me to see the connections between the practice of toy hacking and the possibilities inherent in Connected Learning– particularly the ways that making, sharing, and connecting across generations, across time, and across spaces can support learning and build healthier, more equitable communities. I want to return to some of these ideas that we surfaced and string them out here in words and sentences, as that’s one way that I find I can hold onto and make sense of the beautiful chaos of semi-structured conversation. For most of us, playing with toys is a shared childhood experience. 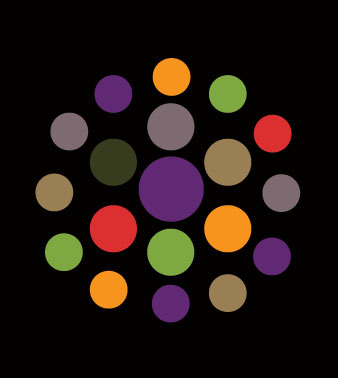 Toys, even the most basic kind we see in this wonderful TED talk shared by Michael Buist on the #clmooc G+ community, are accessible and tactile. Toys speak to our need for joy, our desire to play and our capacity to make believe. As objects, they hold stories and possibilities, and as tools, they help us unlock our imaginations and identities. As Sandra Cisneros writes in her short story “Eleven, ” we are not just 28 or 38 or 58 or 78 years old, we are also 10, 9, 8, 7, 6, 5, 4, 3, 2, 1 and all the numbers between ten and your current age. Toys help us make those connections, to connect our old selves with our new selves, and when we hack them, we learn to re-see, to re-design, to-remake ourselves and our world. Through toy hacking, we can make worlds where ponies and dinosaurs engage in civil conversations about diversity and gender stereotypes. We can make our favorite books spring to life as images and stories pop off the page and into our lives, shaping our beliefs, our values, and our actions, creating civic-minded fandoms like The Harry Potter Alliance and Bronies. We can cover the world in chalkboard paint and rewrite the code of our existence, and we can live in a world where pigs fly and meaning crosses platforms and media from objects to memes and back again. And as Chad Sansing reminded us while he furiously hacked an homage to Adventure Time, toys are a great place to start developing a hacker identity and a maker-centered ethos. Toys are made to be played with, and as kids, we quite naturally push their limits, break them, take them apart, and intervene in their workings to see what makes them tick. If we can develop our capacity to tinker and hack in small, accessible low-stakes systems, like toys, and if we can develop our capacity to leverage the collective intelligence of our networks to solve problems like how to make Storm Trooper puppy drop its R2D2 bone, then we can grow into humans who can think through larger social, political, environmental, and governmental systems. Through toy hacking, we can develop our individual and collective agency to change and build new systems that recognize every person’s need to contribute.